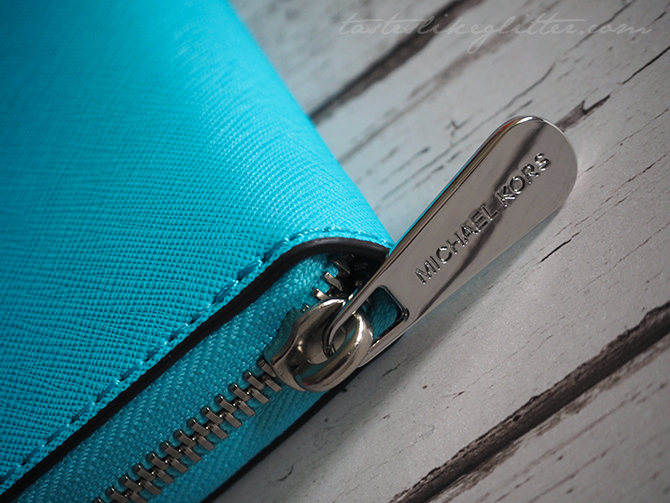 Michael Kors Jetset Zip Around Purse - Aquamarine. Michael Kors is one of those brands that seems to divide people, you either love it or you hate it. Everyone seems to love Louis Vuitton but I can't abide it. I dislike the monogram print and it's one of the most (usually badly) faked brands out there. I'm just not a fan of it but it's down to personal preference and I know many who adore it. I opted for the aquamarine saffiano leather. The colour is a little out there and not to everyone's taste but it's my absolutely favourite colour. So when I saw Michael Kors had relaunched it for this season I had to check it out in person and I wasn't disappointed. Some months ago I made my way to Harrods to purchase a bag, I had a colour in mind - heritage blue but I wanted to check it out in person. Online it looked to be a gorgeous bright blue shade, somewhat similar in colour to this but a little darker. Upon seeing it in person I was extremely disappointed. It was clear that the online images had been brightened and in person it looked surprisingly dull. I went all that way and I was determined not to leave empty handed so after much deliberation and back and forth, I finally settled on a colour which I'm sure I'll post about at some point. It also comes with silver hardware, rather than the usual gold. As it's such a cool toned blue I think the silver goes well with it. Plus I favour silver as it's what I wear. Saffiano leather was invented by Mario Prada and was once patented by Prada but it's now been used by many power brands. The texture is pressed onto the leather by a machine and then given a wax treatment which gives the leather it's sturdy and durable finish. It has a distinct cross hatch design to it which helps keep the leather resistant to stains, scratches and also makes it water repellant. Again, saffiano leather is one of those things that divides people. Some prefer it for it's low maintenance over calfskin. But others feel it looks too plasticky and prefer buttery soft leather. I've always read about how you need to be extremely careful of the Chanel lambskin. It's a very fragile leather and not one that is suitable for everyday use. Whilst it's a classic finish, it's easily marked regardless of how careful you are with it. Anyway I'm getting slightly off topic. One of the things that drew me to Michael Kors and it's range of leather goods was the saffiano leather. I like something that I can use everyday without fear of it being easily ruined. With saffiano I don't have to baby it too much. The purse itself is on the larger side. There is a smaller version that comes with a wrist strap but it had barely any card slots and I just didn't really feel like I'd get on with it well. I like purses that are a little more roomy. It has 2 bill slots on either side of the purse with 4 card slots on each side. The majority of the back card slot is made from the material lining. It has a section of leather on the top so that it looks seamless. I'm not sure if I'm explaining this at all well?! But because of this I find that the card slots can easily fit two cards in each if you so desire and I don't feel like they'll stretch and become loose. This happened with my previous Marc Jacobs wallet, which I was not best pleased about! It's also not extremely tight so that it's hard to get your cards out. Then you have two pockets which I usually stick my receipts in and the zipped coin compartment in the middle. Though this was a rather luxe purchase, I don't regret it at all. Some may say that it's a ridiculous price to pay for a purse. But I see it as more of an investment. I recently bought a purse from Boohoo for around £10. It was ok for a few weeks but the quality just wasn't there. Instead of repurchasing new ones every couple of months I'd rather pay a little more for something that's going to last. It's not in a timeless classic colour but I love it regardless. It's my favourite colour (hello, it matches my blog!) and it really brightens up my day more than a plain colour like black would. Overall I adore the quality of the leather. It's a really great size, the inside doesn't feel too cramped and I love how durable the leather is. I cannot recommend the saffiano highly enough. It really is perfect for everyday use.